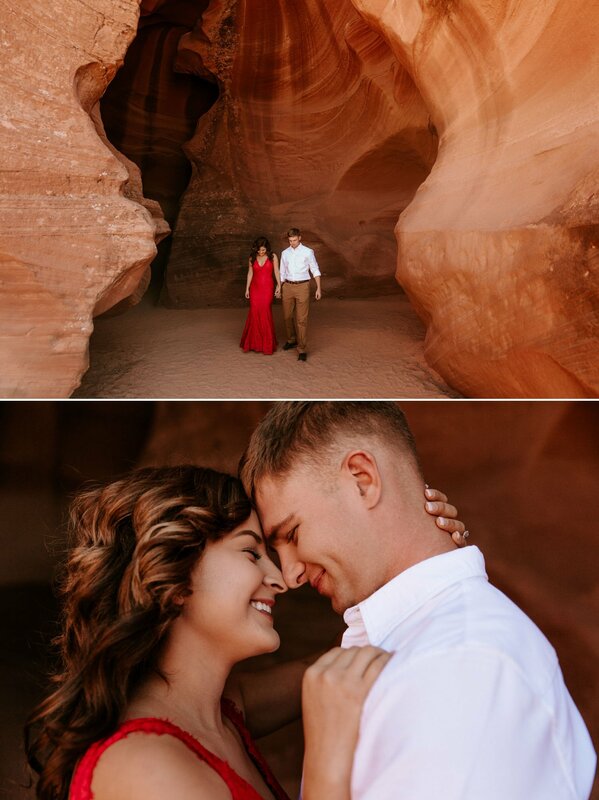 Dania and Trent’s destination engagement session at Horseshoe Bend and Antelope Canyon in Page made all my desert dreams come true. 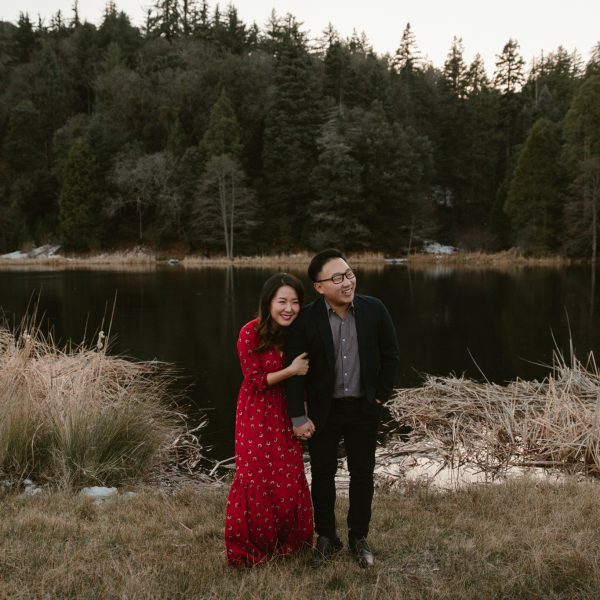 I was itching to get back to this rural town in Northern Arizona ever since our Grand Canyon road trip in 2016. These two drove all the way from Yuma to meet us that afternoon. 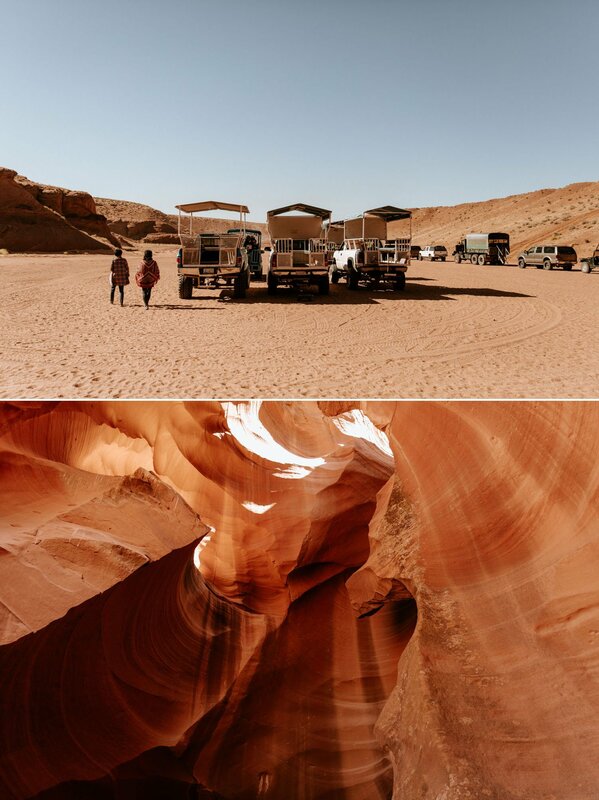 Dania booked our private tour through Upper Antelope Canyon well in advance. We met in front of the tour office and piled into our guide’s SUV together. After a short, bumpy ride, we pulled up to the entrance of the slot canyon. All of the parked caravans made me feel like we were about to embark on an Indiana Jones adventure! 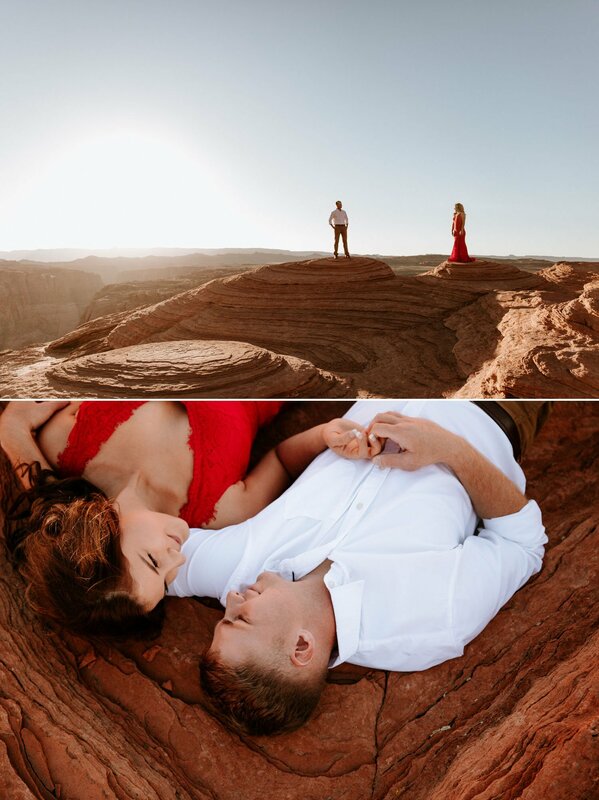 Dania dawned a bright red dress for our session, which looked awesome in contrast to the surreal desert landscape. These images are a little deceiving because the canyon was packed with tourists that afternoon. Luckily, booking a private photo tour meant we had time to ourselves in each chamber. The canyon grew darker and darker as we made our way through the winding tunnels. I had no choice but to bump my ISO way up for this set of images. But I actually love how much drama the moody light and grain created! We spent an hour or so wandering through the slots before making our way back into town. 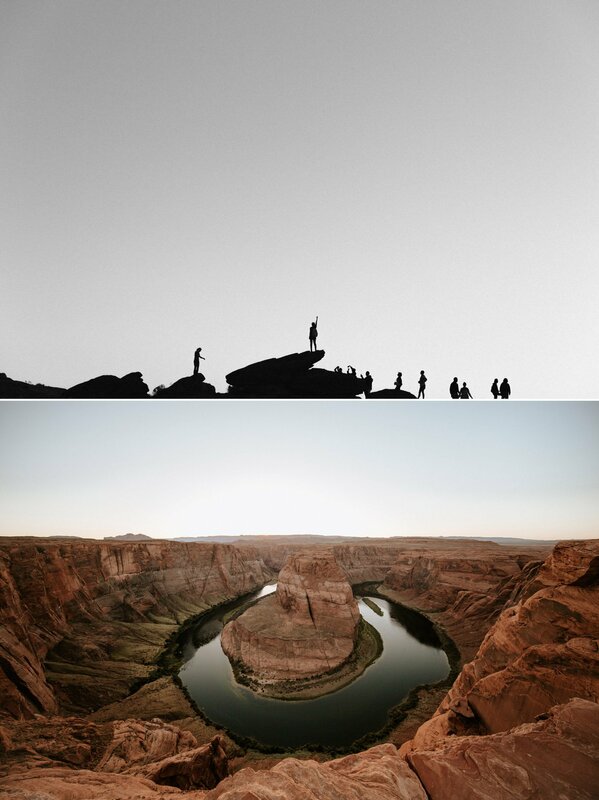 We took a break for lunch and met up again for golden hour at Horseshoe Bend. The view was even more spectacular than I remembered. To bypass the heaviest foot traffic, we explored the outer edges of the bend. Vertigo doesn’t scare Dania and Trent the same way it scares me! They cozied up to the edge of the cliff more than a few times. As the sun set over the mountains, the rocks around Horseshoe Bend glowed red. We stayed out until moonrise, then slowly hiked our way back to the car. 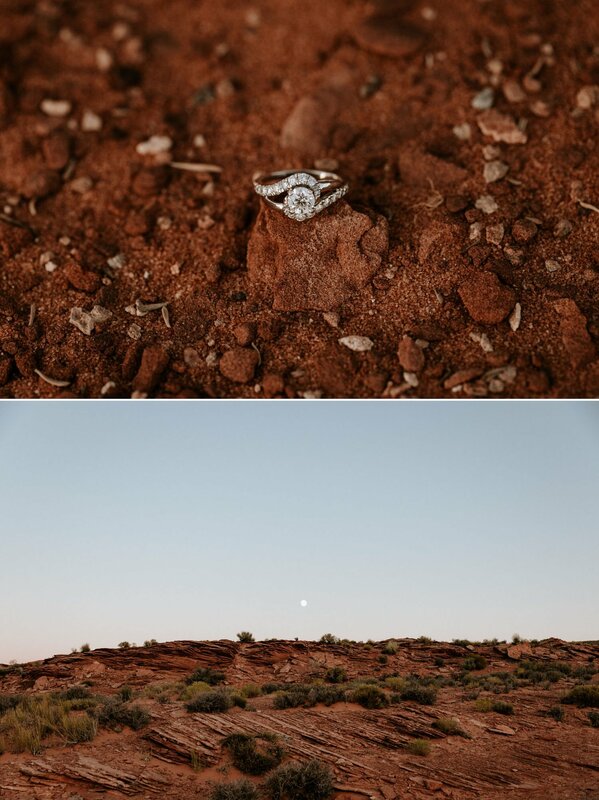 It was the perfect way to wrap up our epic adventure. This trip couldn’t have had better timing, considering the traumatic events that happened on October 1. Andrew and I planned to cut our road trip in half by flying out to Las Vegas the day before, then driving to Page through the night. Our plane landed in a somber Vegas the day after the Mandalay Bay shooting. Our favorite artist, Tom Petty, also passed away that evening. We listened to the Heartbreakers on repeat that night as we tried to take it all in. I thought this song set the mood of this session perfectly. This one goes out to you, Tom. 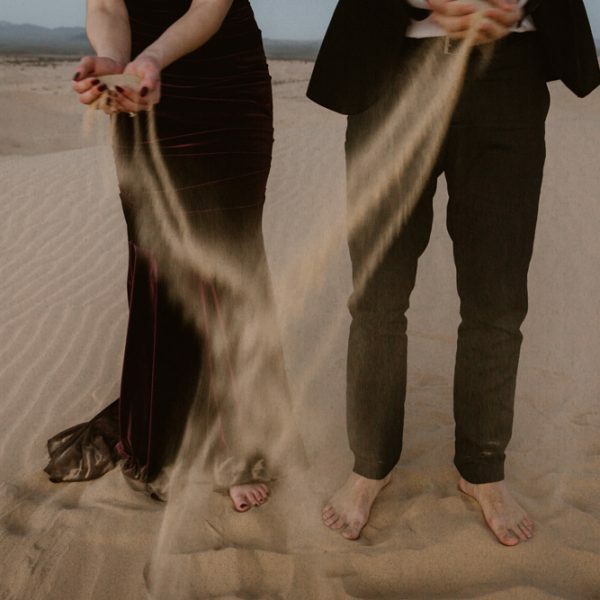 If you enjoyed this adventure session, I recommend browsing through Brogen & David’s Anza Borrego portraits or Kiara & David’s styled elopement at Red Rock Canyon. These are just stunning! The photos are so full of emotions. Love your style. Thank you so much, I really appreciate it! I only hope I can do these landscapes justice. 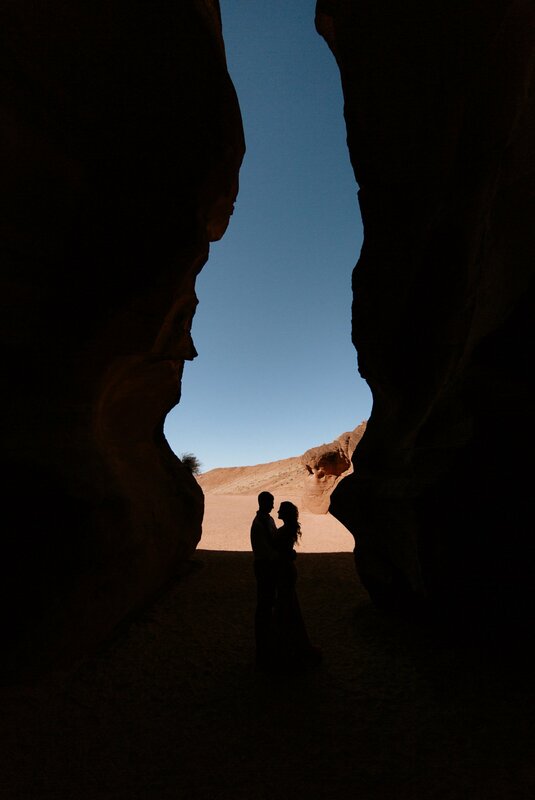 :) Have you been to Horseshoe Bend or Antelope Canyon before? 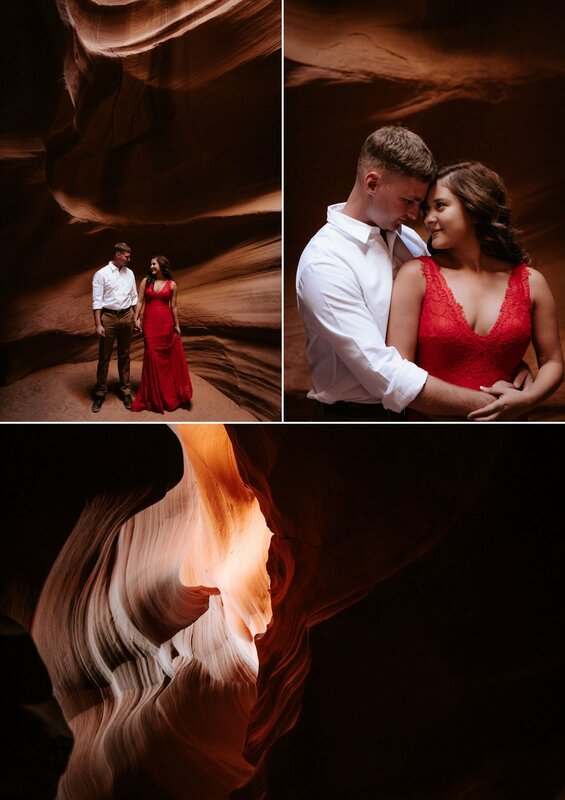 How can I have engagement photos taken at Antelope Canyon?